I once worked briefly for an Army Colonel. He could’ve stepped off of the movie set of Apocalypse Now: tall and wiry with a stiff and graying crew cut, a brisk manner and a lopsided, slightly maniacal grin that revealed a mouthful of misaligned teeth. Plus the requisite rich southern accent and an endless supply of (to keep things G-Rated here) “earthy” sayings. I kept a mental catalogue of his favorite expressions, one of which was “it’s an ugly baby.” Well, back on October 27, 2011, I published a post of several ugly babies. 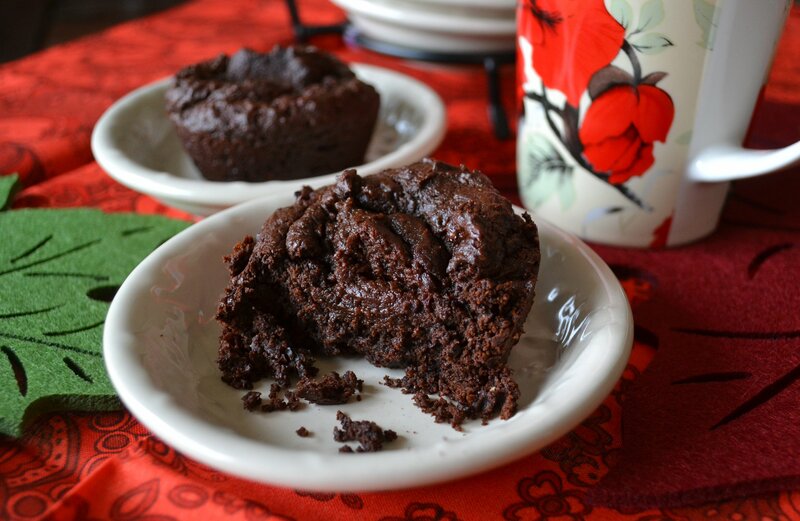 The post was titled A Delicious Failure: Sunken Chocolate Cakes and the recipe was based on one by Marcel Desaulniers called Heart of Darkness Cakes. After my failure, tasty though it was, I vowed to try again. It’s taken me over a year to do it. They’re still ugly babies, but my, they are delicious. (If chai isn’t your thing, just leave out the spices and you’ll have a delicious chocolate truffle.) Coming up soon: Black and White Cakes – a vanilla version of the above – which cleverly and thriftily uses the leftover truffle filling made for these cupcakes. Cut down on the calories a little bit by using Lily’s Sweets stevia-sweetened and vegan semi-sweet chocolate chips. So rich and decadent, they’ll win over even the staunchest non-vegan in your life! Drain and rinse the dates, pecans and crystallized ginger and put them in the bowl of a food processor. Process until finely ground. Meanwhile, carefully melt the chocolate chips and the coconut oil in a small saucepan over low heat. Whisk in the cocoa powder. When melted and combined, remove from the heat and set aside. Spoon the mixture date/pecan mixture into a blender and add the almond milk, all of the spices and the chocolate/coconut oil mixture. Process until silky smooth. Pour into an air-tight container and refrigerate for a few hours to firm. I rolled mine into sloppy balls (~20) and placed them in the freezer to firm up – making them easier to handle when putting them into the cupcakes. Preheat the oven to 350-degrees F and lightly oil 10 muffin tins (fill the empty tins half-full with water). In a small saucepan, slowly heat the coconut oil and the chocolate chips until melted. Remove from the heat and set aside. In a large bowl, whisk together the flour and cocoa powder. In a smaller bowl, combine the prune puree, flaxseed meal mixture, vanilla extract and coffee flavoring, if using. Whisk the chocolate mixture in with the other wet ingredients and then stir this into the dry ingredients. Batter will be very thick and gooey. Divide the batter evenly between the muffin tins and bake for 5 minutes. Carefully remove the muffin tins from the oven and drop truffle filling by the teaspoonful+ on top of each muffin – gently pressing the filling down into the cupcakes. Return the muffin tins to the oven and bake for an additional 15-20 minutes or until the cupcake is firm and a toothpick comes out clean (from the cake, not the truffle). Let cool for a few minutes before removing cupcakes from the pan. Serve warm. That chocolate gooeyness is gorgeous, just the thing for a dark damp day. And congratulations to Paula on winning the book! Totally permissible to be “ugly” in this case, don’t you think ;-)? Beauty is in the eye of the beholder, and I don’t think there’s anything ugly about these! They’re my weakness, Gabby – and I love making them. Sigh. And eating them :-). Haha same here! I’m a sucker for a truffle. The nice thing is – it makes tons of truffle – leaving plenty for “testing” purposes! Is it possible to use either spelt flour or gluten free flour instead of teh whole wheat? The recipe looks fantastic. I’m sure spelt would be just fine, but I don’t have a lot of experience using gluten-free flour so can’t say for sure. Those are anything but ugly! I’m so glad you didn’t give up and that you revamped the recipe! It looks too good to be true! Congrats to Paula on the Slow Cooker Giveaway! Never give in, never surrender! When it comes to chocolate. Thanks – gooey and scrumptious just about say it all :-)! Such a decadent looking dessert! Great job 🙂 congrats to the winner too! Gooey chocolate, I’m in! And I adore chai. Wow!! Thank you! Very cool :-). Apologies for responding to this so late, btw. What amazingly, rich & nearly decadant looking truffle cupcakes! So good, so tempting & not so bad for you too! I’m so mindblown over these! I can’t imagine a more perfect dessert! I know – I need to detox!! Thanks, Sarah! When I posted this on FB this morning I was thinking: how quickly can I make these and get them into my mouth ;-)!